Naomi Watts and Robin Wright star in what has likely been the most divisive film to screen at the Sundance Film Festival so far. Two Mothers is the story of two close friends (played by Watts and Wright) who have secretive affairs with each other's sons. The weekend premiere in Park City sparked a mix of laughter and polarized reaction that took the feature's stars and director, Anne Fontaine, by some surprise. Tuesday night, the New York Film Festival and the Academy of Motion Pictures Arts and Sciences hosted something that is likely a rarified event in the usually hallowed theater venues at Lincoln Center - a boisterous and rowdy crowd, but the event had a noted culture shift. The occasion was the 25th anniversary of The Princess Bride and a good chunk of the living cast showed up, including Robin Wright, Cary Elwes, Mandy Patinkin, Chris Sarandon, Wallace Shawn and Billy Crystal in addition to director Rob Reiner as well as author William Goldman. Random shouts of "meathead" could be heard from the audience - all loving of course - when Reiner was introduced on stage as first coming to prominence as Michael Stivic in 1970s television show All in the Family. The Princess Bride was also likened to The Wizard of Oz (1939) - something Reiner fully embraced. The last few months have provided us with some iconic imagery of police violence in response to the Occupy Wall Street movement -- Lt. John Pike casually pepper spraying a group of UC Davis students like he's Febrezing a sofa, 84-year-old Dorli Rainey being helped away from a confrontation in Seattle after being doused herself, Marine Scott Olsen getting carried out through a haze of tear gas in Oakland with a fractured skull. These recent events lend Oren Moverman's Rampart a queasy immediacy even though it's set in the '90s, as the LAPD's Rampart Division struggles through the notorious police misconduct scandal that ended up implicating dozens of officers and inspired the likes of Training Day and The Shield. If you've been staying with your grandparents this week or your job involves caring for the elderly, then you've probably already realized that Good Morning America has been hosting a Totally Awesome '80s series where anchor Robin Roberts reenacts E.T. scenes in front of a green screen. (I wish I was kidding.) Anyway, that's happening. 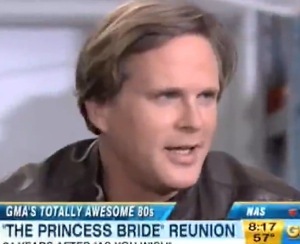 And as part of this series, ABC hosted a cool reunion for the cast of Princess Bride 25 years after the film's release. Take a look below.